Coming home day – I hate packing up and leaving a place especially when there is so much more to see and do! Never mind, we have done a recce and there is scope for another trip now we know the lie of the land and have some ideas of what else we want to do in the area. 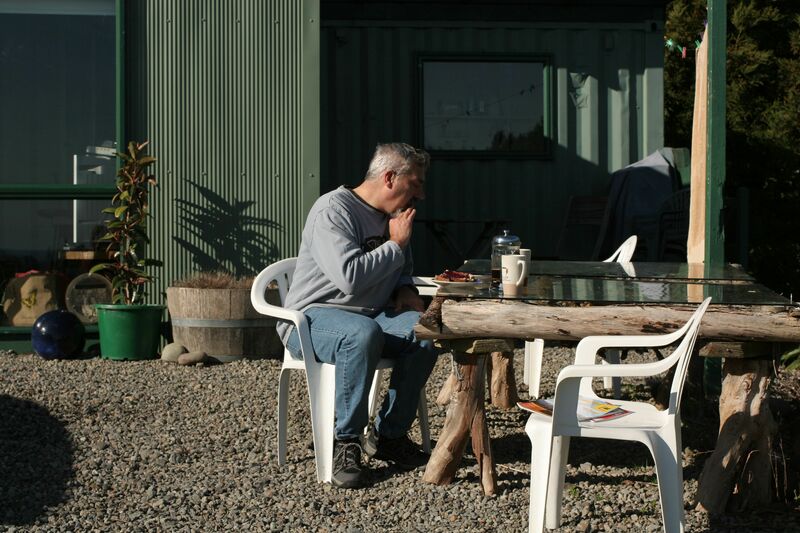 The plan was to stop at a few places north of New Plymouth on the way back, maybe get some lunch at a nice little place …. We started off by calling in at the gift shop in Oakura – not much to say really – the usual touristy stuff at usual touristy prices! On to Urenui where according to the guide book we would find Mike’s Organic Brewery, and then a little further north the start of the Whuite Cliffs Walkway and the Three Sisters. Mike’s Brewery was easily found and after tasting a few different brews we decided on buying a couple of bottles of the IPA and a couple of the Coffee Porter. Our cat sitter is a home brewer and we thought they would make a good thank you present, and we had to have some for ourselves, of course! Will leave Nigel to make further comment on this section as he is the expert! 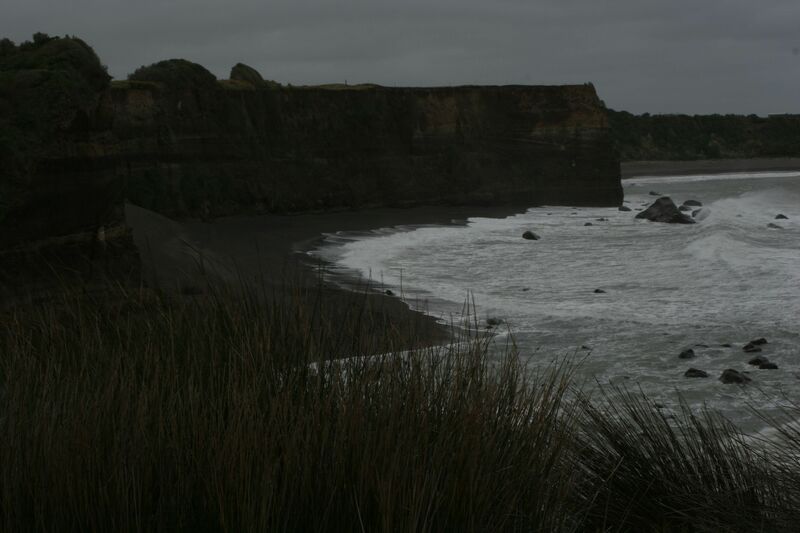 It turned out that although the turn off to the White Cliffs walkway is just a little way north of Urenui, the Three Sisters themselves (actually now the Two Sisters as one has collapsed due to erosion, although another one seems to be in the process of being created so there soon may be three again) are at Tongaporutu. One end of the walk starts 11 km along the no exit road just north of Urenui and finishes in Tongaporutu but we were told at the Brewery that the path is closed during the winter. Nevertheless, we decided to turn off and drive along the coastal road as there was a beach at Waiiti that we wanted to visit anyway. Waiiti is a beautiful beach, the sand is very black and it is home to Little Blue Penguins although we came at the wrong time to see any. Unfortunately the tide was on the way in and so although we had a little time to clamber over the rocks and explore we had to keep an eye out that we didn’t get stranded. There were masses of shells so I was in my element collecting them, Gus also made a large collection of pebbles which he struggled to fit in his pockets and which weighed him down considerably! 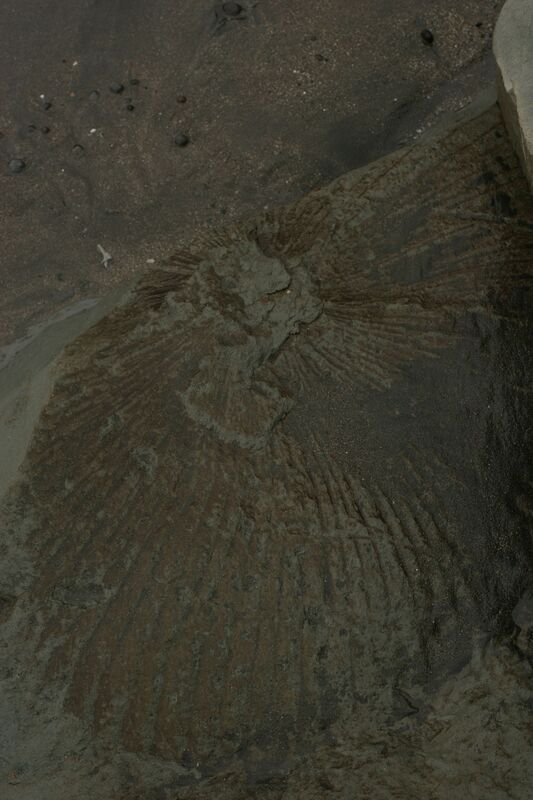 The rock formations at the cliff base were interesting and there were also large fossils. At some point following a volcanic eruption ash had settled over this area and buried huge forests and there is still some evidence of this on the beach. We met a lady who said that she remembered when she was younger that at low tide you could see hundreds of tree stumps exposed. However, she said that now there was a lot more sand and less of them were exposed even at low tide. Nevertheless we did see a couple of them at the sea edge and at the back of the beach there was clear evidence of branches in ash layers. Also interesting but quite unpleasant was the amount of dead seabirds on the tideline. After the heavy winds recently it was reported that lots of seabirds had been washed up dead on the beaches in Northland; according to a lady we met on the beach approximately 1000 dead birds had been picked up from Waiiti beach in the last couple of weeks. It seems that the Prion which is a small Petrel flies low over the ocean and so when the swell is big and the wind is strong they are caught by the waves and drowned. We spent a good hour wandering along the beach, Lachlan found a cliff to climb to add to his enjoyment and make the walk more challenging and as well as beach combing Aonghas and I watched the waves, and ran away from them as we tried to wash our shells and stones! Onwards then! We went back along the road and onto the main road and up to Tongaporutu to see if there was any way we could see the Three Sisters. No, the tide was definitely all the way in and we had run outr of energy for exploring higher up on the cliff, just in case we got a better view. We’ll just have to leave that for another trip! We were also feeling a bit peckish by then and so pushed on to Mokau where we had been told would be the next opportunity for a cafe. 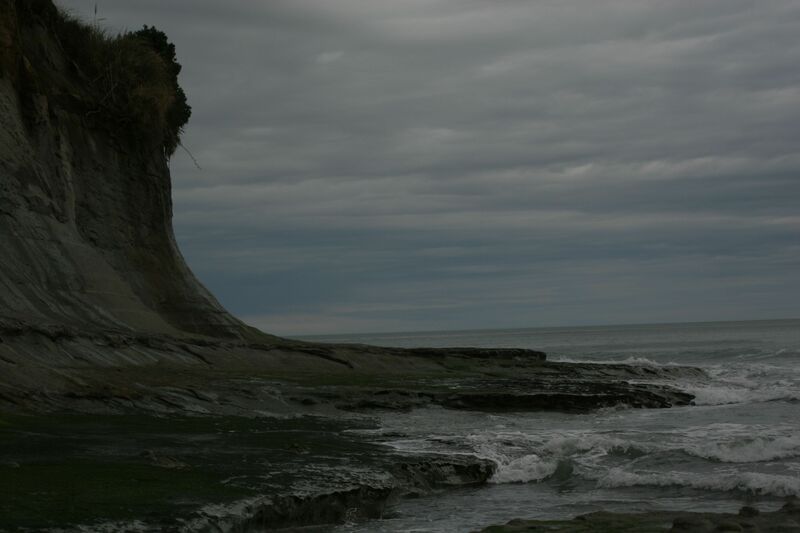 Mokau is an odd little place, over the border from Taranaki and into Waikato. It is on a bend in State Highway 3 and is a popular whitebaiting spot and general fishing area. It is also home to the Tainui Historical Society Museum where we were treated to a personal tour by a delightful gentleman who was clearly passionate about the museum and the history of Mokau and its people. 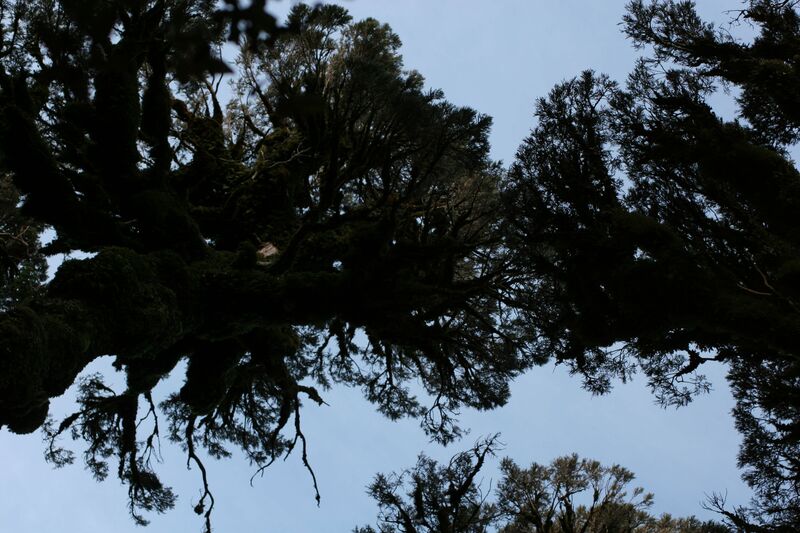 He told us of the coal mines 24 miles up river, some well-decorated caves in the area, stories of the Maori and the Pakeha and lots more. The river is tidal right up to the coal mines and ships would come up on high tide, load the coal and then wait for high tide to come bvack down to the coast again. He also told us the story of the bridge which spans the Mokau River– when it was first proposed the farmers of Taranaki were worried that rabbits from Waikato would come across the bridge so an agreement was reached that a house be built by the bridge, a gate be put on and a person be employed to check that rabbits did not come across the bridge! Another example of a No8 Wire man, he has adapted and fixed up some of the machines and gadgets in the museum; he treated us to a rendition of some tunes on the pianola which he has attached a vacuum cleaner to to form the seal to make the pipes work properly. Awesome! We eventually prised ourselves away but I am sure he would have carried on with his stories all afternoon if we had let him! As we left he gave us a brochure advetising his river trips up the Mokau; a few years ago he bought an old Cream vessel and is using it to do river tours – sounds like a plan! We also need to get some more info on the caves he told us about…. It rained all night, and rain on a tin roof always sounds like it is a lot heavier than it really is! It was windy too and the sound of that is similarly amplified when you are in a small tin box. Nevertheless, the small tin box was warm and cosy and by the time morning came around the rain, at least had stopped. Another leisurely morning, I was resigned to it by now and in fact was happy to stay sleepily snuggled up in my duvet, with my own personal bedwarmer (Nigel!). However, we couldn’t stay there all day as “that would be a waste”! I was keen to explore down the coast and maybe have lunch in a cosy cafe and buy something nice in one of the craft shops that I had been told were dotted around. Surf Highway 45 is a route that according to the guide “passes dozens of surf spots and many more cafes, art and craft studios and eclectic antique shops”. So we piled into the car and set off for Opunake, deciding that we would go straight there and then stop at places we had earmarked on the way back. The wind buffeted the car all over the road and Nigel must have had a good work out maintaining a straight line! It has to be said that we were quite disappointed with the villages/towns we went through; sad, ramshackled, abandoned looking places with tatty buildings, sprawled along the roadside, sometimes a pub or a bar or a village store. I guess that they may look a little different in the summer and maybe they were closed up for the winter; it is true that this is a surf haven which comes alive in the summer months and the population balloons. The beaches are often a few kilometres from the road, so there is a disconnect between the two, maybe there is no real reason to have a community except in the summer? Opunake is actually on the coast so the beach and the town are close together. It is a bigger community than any that we had come through and “home to distinctive murals, cosy cafes, eclectic shopping and a laid-back surf culture”. It certainly has murals and they definitely brighten up the place on a cold wintry day, we found one cosy cafe although I guess in season there may be others that simply shut up shop in the winter, as for shopping – well there was little evidence of any opportunities there! After a brief walk on the beach we found refuge in the Sugar Juice Cafe which is certainly worth a visit – great coffee, a huge range of delicious food, warm and welcoming. Go there! The (World Famous) Egmont Soap Factory has its home here too – push on the boarded door with its faded “Open”sign on an old wooden shed with a tin roof, and you find a draughty room with a couple of tables laid with baskets full of different coloured soap. The cloying smell of mingled fragrances is heavy in the air and almost makes your eyes water. It made me think of Christmas parcels we made up for elderly great aunts and grandmas with handkerchiefs and bars of lavendar soap. We almost turned to leave as an old shabby looking man shuffles out of the back room and greets us; he is a garrulous chap with a friendly smile and he engages us in conversation. Where are we from, doesn’t he know me from somewhere? He has relatives in Hamilton and he starts to tell us tales of meeting people and always remembering a face so he must have seen me somewhere! He tells us how the soap is made and how as a retired Chemist he got involved in the business and which big companies buy it and use it wrapped in their own packaging, how they have developed the lines and have branched into sensitive skincare products. The most interesting part, though is the machinery he has developed for making the soap; a collection of cast off contraptions from dairies and other agricultural establishments that he has adapted and refined, for example the machine for stamping the pictures on the soap is an old cheese press. It is real No8 wire stuff and it would have been fascinating to see it all in action. Winter is clearly not manufacturing time, though and for the moment it just looks like a pile of old machinery that has been stored indoors before sending to the tip! We bought a few bars of soap (how could we not?) and he gave the boys a free sample bar each before we carried on our exploration of Opunake. 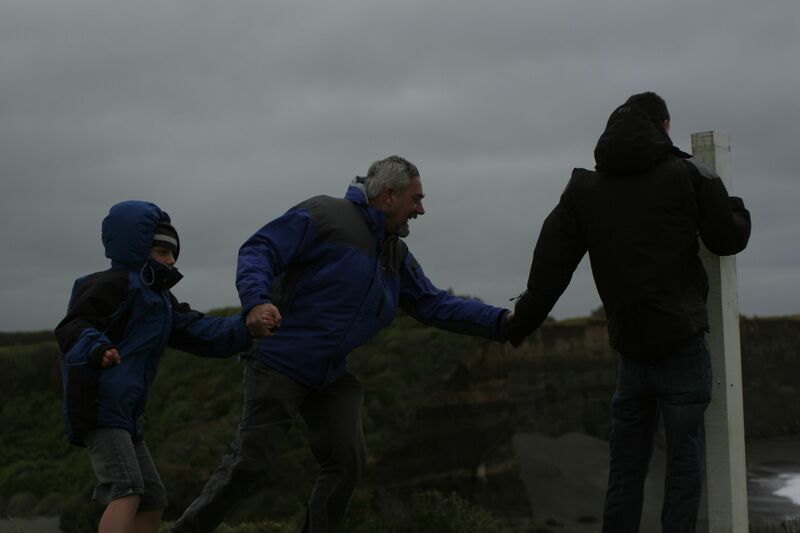 Lachlan was reluctant to brace the cold south easterly and walk along the coast and, I have to admit, there was a part of me that said let’s just go back to the bach and curl up by the fire. But we were there, and it may be a while before we go back and it would have been a waste to drive all that way just to sit in the bach and not see what we had come to see! So we wrapped up in all our woollies and waterproofs and strode out to face the wind. 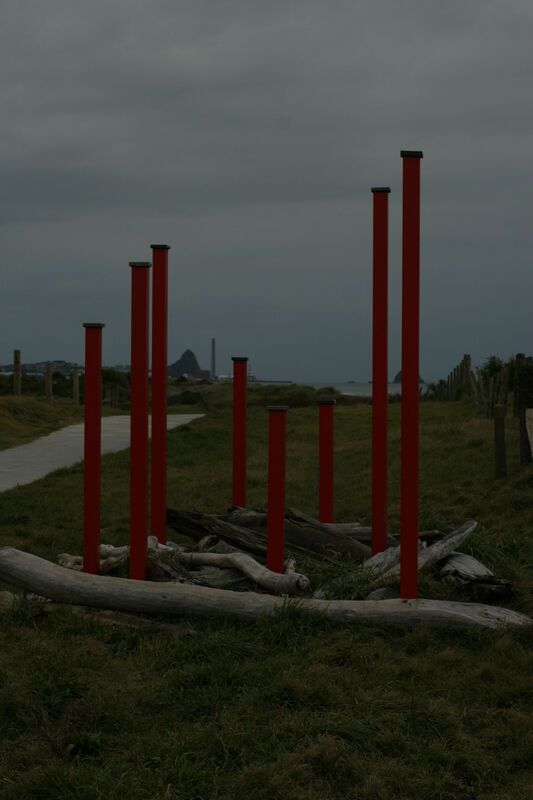 The coastal walkway takes you first to a small graveyard where lie a few souls from the Armed Constabulary that were stationed at Opunake in 1880. 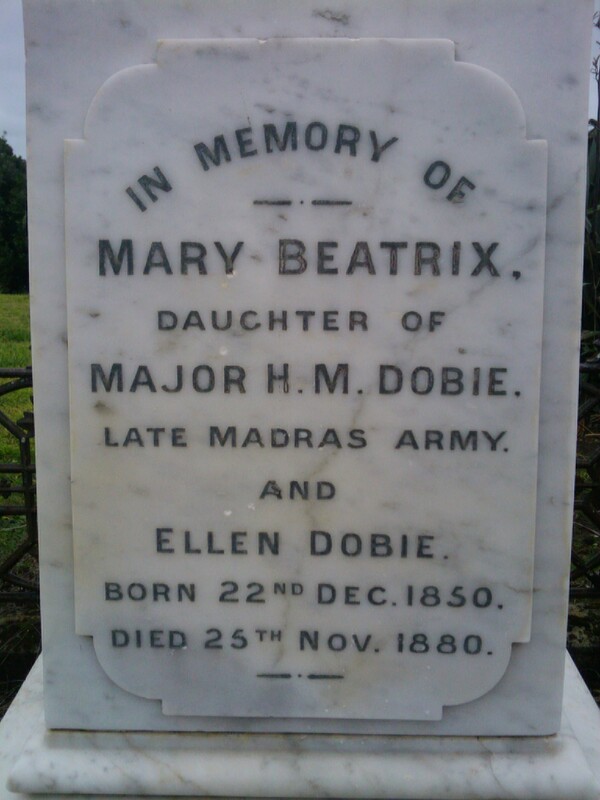 There is a quite large memorial erected by the non-commissioned officers and men of the Armed Constabulary in honour of Mary Beatrix who died at the age of 30 in Opunake. We thought it strange that there should be such a large memorial and speculated as to the reason. Googling is a wonderful thing and with just one or two clicks I have found the story behind the name. was exhilarating to be high up above the ocean battling against the elements. The sea was wild and mesmerising as we watched the waves crash over each other, the spray being blown off the crest as it broke. We didn’t do the whole coastal walk, we just dipped into sections jumping back into the car in between but it was enough to get a flavour of the place and blew the cobwebs away! 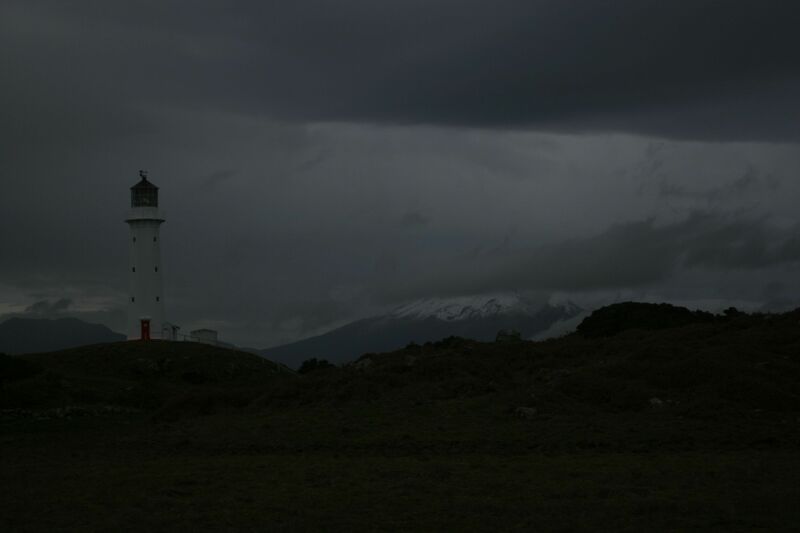 At the westernmost point of the Taranaki coastline we stopped at the Egmont Lighthouse which was made in England, shipped in sections to NZ and was originally on Mana Island near Wellington before being brought to Taranaki in 1874. It was simply a photo stop because by this time the boys had had enough of getting in and out of the car and just wanted to go home! They were singularly unimpressed with this small lighthouse which was positioned well inland as far as lighthouses go – usually they enjoy getting out and clambering over rocks to reach lighthouses! Gus had been pestering all week about going out for dinner to a restaurant, several lunches in cafes just weren’t enough for this lover of fine food and dining out! So we headed into New Plymouth after a quick wash and brush up back at the bach since it was our last night. We found a lovely Italian restaurant called “La Bella Vita” where we ate well and had a thoroughly pleasant time. This morning was bright, with enough blue to mend a sailor’s trousers but the clouds were gathering and there was definitely rain in the air. Gus and I were up and keen to head out but Nigel and Lachlan slept soundly until Gus made enough noise to wake them at about 10am! Another slow start to the day and as the morning wore on, the sky darkened and what little sun there had been retreated, beaten back by the wind. 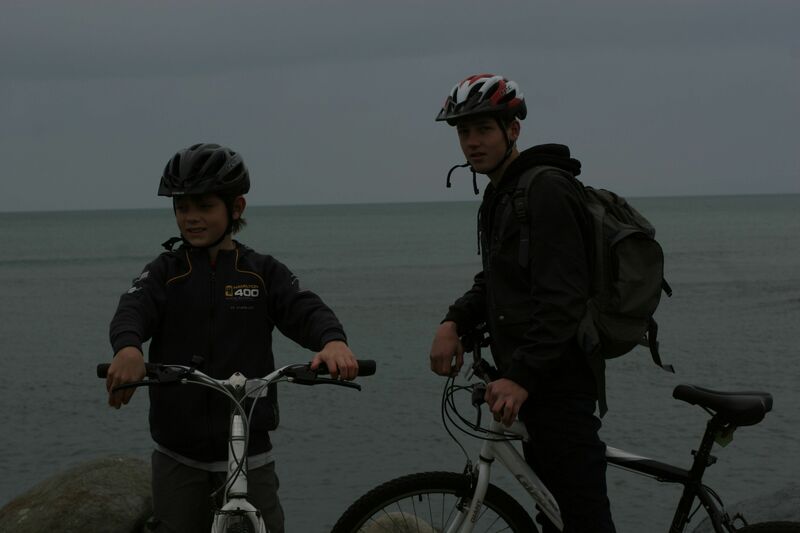 Nevertheless the forecast suggested that the rain would hold off until evening before setting in for the next couple of days so we decided to hire bikes and ride the New Plymouth Coastal Walkway. We set off on our “retro, built for comfort” steeds heading north into the wind to get the benefit of the tail wind on the return journey! According to the blurb, the walkway is “ideal for walking, running, cycling or skating, or simply enjoying the view of the dramatic west coast”. It was good to get out into the fresh air (and, indeed, it was fresh! ); we started out in the middle of New Plymouth where the path runs along the coast, through a holiday park with access points to the surf beach at Fitzroy. 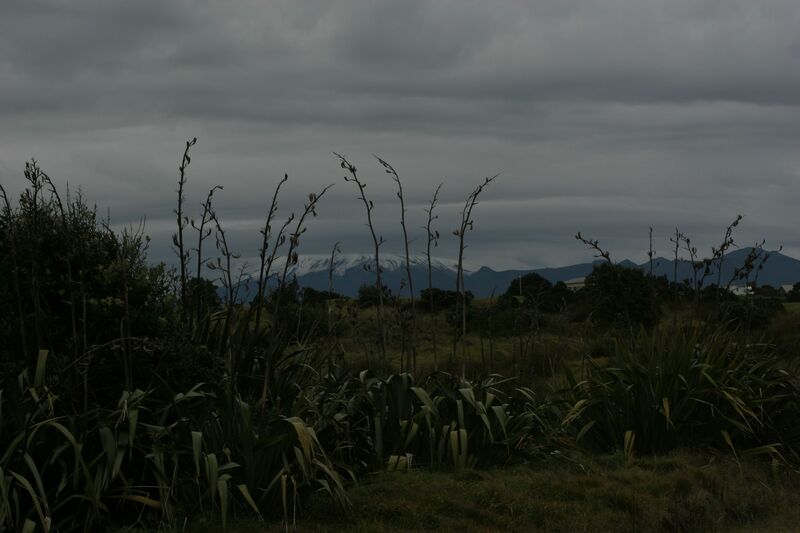 Then we came to the Te Rewa Rewa Reserve where the path meanders through the Toetoe. There is work going on here to replant natives and restore the dunes and the natural habitat behind them which in turn will help reduce the coastal erosion and maintain the area for generations to come. 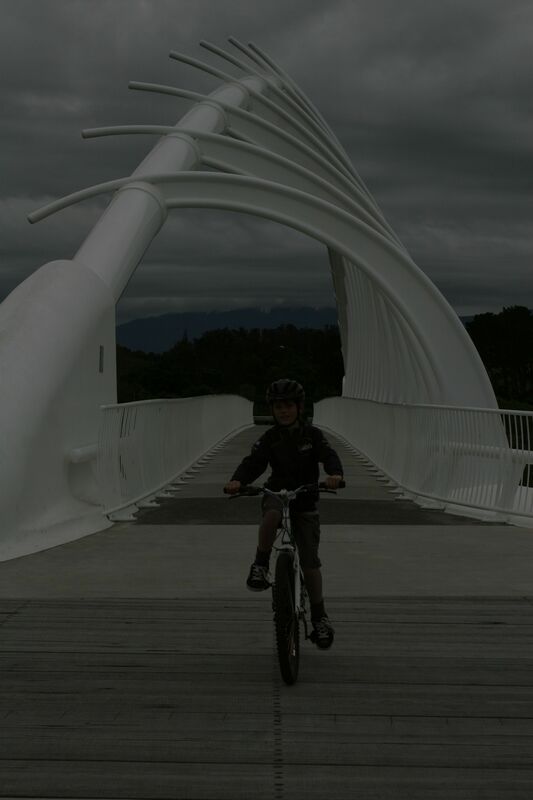 The Waiwhakaiho river is spanned by what has become an iconic award winning bridge – the Te Rewa Rewa Bridge. I love it! 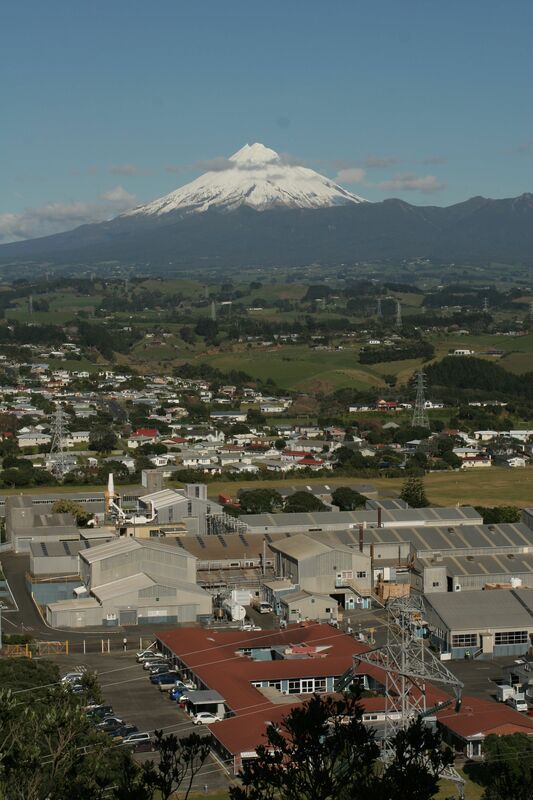 Unfortunately, as Lachlan said, we came on the wrong day as if you look through it from the northern end it frames Taranaki perfectly – that’s if it isn’t blanketed in cloud as it was today! Meandering on through farmland past a couple of what I thought were uninspiring sculptures we stopped often to look out at the ocean flecked with white horses. But the air was getting wetter, how long could it hold it before letting the rain loose on us? We decided at Bell Block that a hot drink was in order before heading back, but where? Nigel consulted 4Square on his phone which suggested that there were two cafes in the area. After asking a passerby for directions we found our way to a cafe where we had coffee and cakes. The warmth of the place was welcome and we found it hard to step back out into the cold wind. However, the rain was holding off – just! We didn’t bother stopping to take in the views on the way back; apart from the cold and wind and finally the rain, we had to get the bikes back before our three hours was up and they turned back into pumpkins! 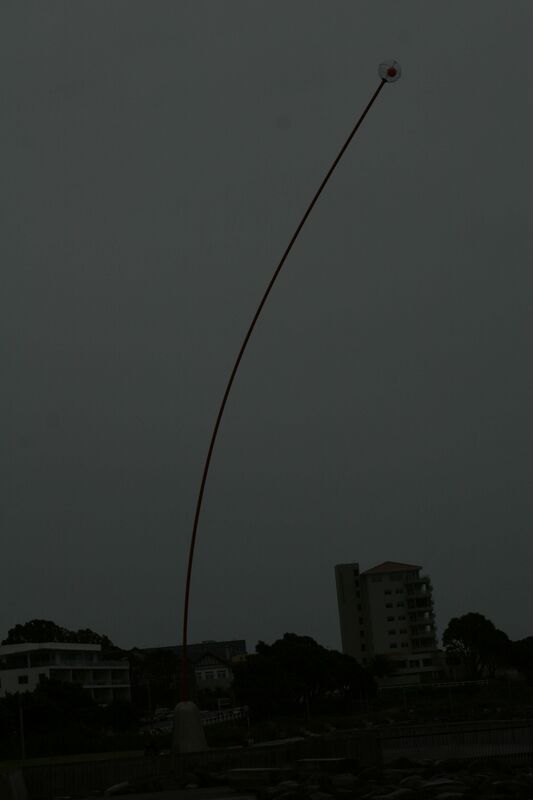 There was just enough time to racedown to the city centre to see Ken Lye’s 45m Wind Wand swaying before delivering the bikes to the Cycle Inn. 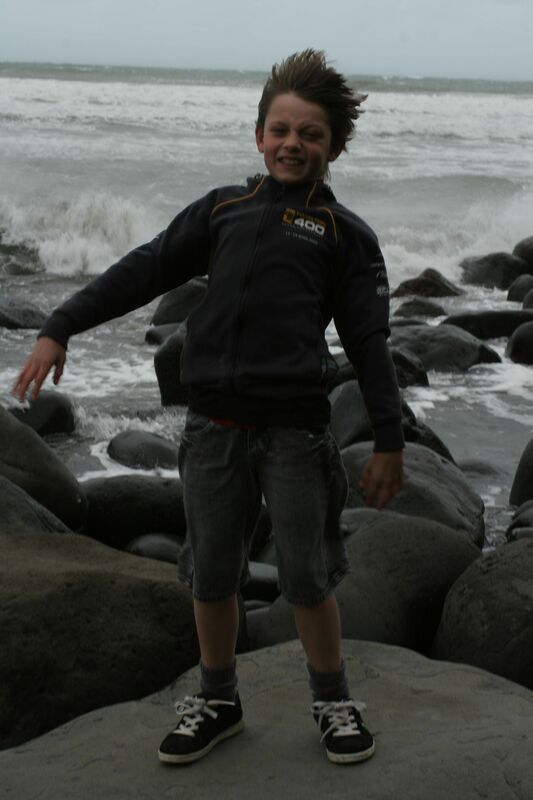 The rain had really set in now and Aonghas’ second request for the day was to go to Puke Ariki, New Plymouth’s museum. It seemed like a perfect thing to do on a wet, windy winter’s day so off we went. It is only a small place but is packed with heaps of information and displays. Far more than we could “do” in the couple of hours that we had but we enjoyed it nevertheless. Downstairs they have an area with some strange exhibits which the curator said had been found in the archives when they were setting up the museum. They decided that rather than just put them out with labels it might be more fun to ask the visitors to guess what they might be. This has proved to be a very successful idea and the boys spent a good hour and a half wandering round making suggestions on the cards made available and pinning them on the display boards. It was also fun reading what other people had written. Interestingly the real explanations weren’t half as inspiring as the imaginations of the New Zealand public! Nigel and I snuck away for a coffee whilst the boys exercised their imaginations until we were discovered and dragged back to the exhibits! The displays upstairs on the geography etc of the region are very informative and I particularly liked the explanations of the history of eruptions of Pouakai, Kaitake and Taranaki and how they shaped the land as it is today. The Maori section is also cleverly put together and I would happily have spent a lot longer browsing, but the boys were hungry, the museum was closing and it was time to go back for tea! Definitely a place worthy of a longer visit! The weather forecast was for it to be fine but clouding over as the day progressed, winds to increase and gradually give way to showers the following evening. The rain would become heavier by Friday. 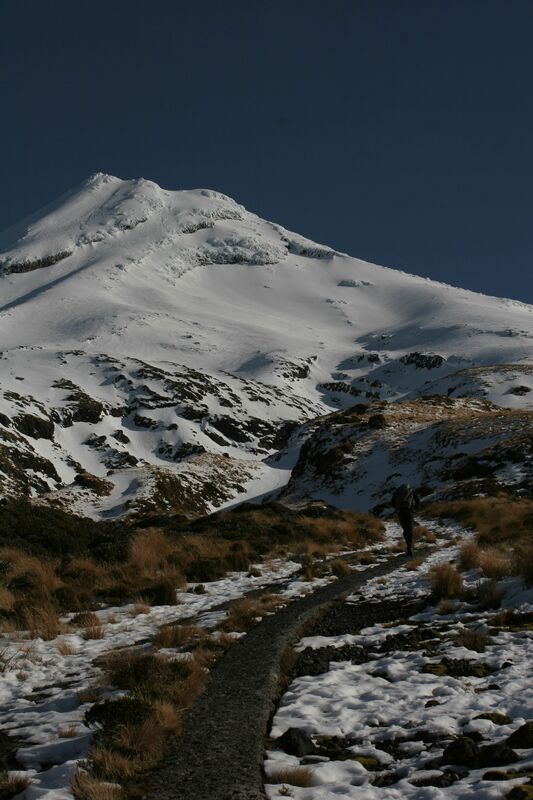 If we wanted to go for a decent walk on the slopes of Taranaki it would have to be today! 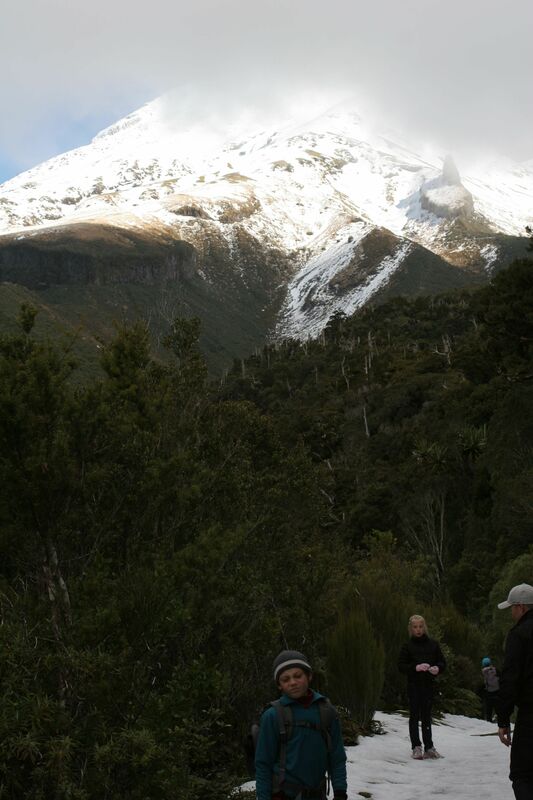 It was after 12.30pm before we finally got ourselves together and arrived at North Egmont Visitor Centre. We checked that the route we planned was okay to do in the conditions, had a dither in the display area and shop and bought a map. 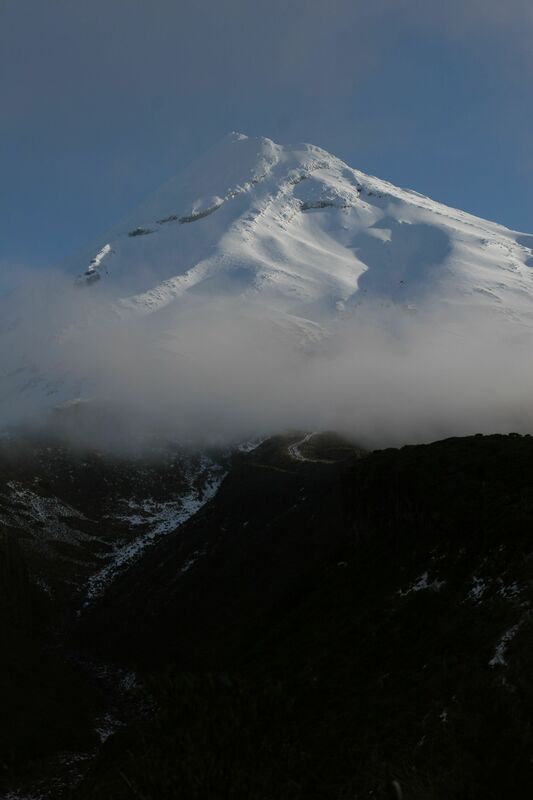 Taranaki was in cloud and it was pretty cold as we added layers in the carpark but soon we were off. As we walked the cloud blew this way and that, first covering the peak and then leaving it clear and proud. The bank of cloud that had looked like a pretty solid front moving in from the sea seemed to dissipate a bit as it came over and most of the afternoon was spent with the sun shining. 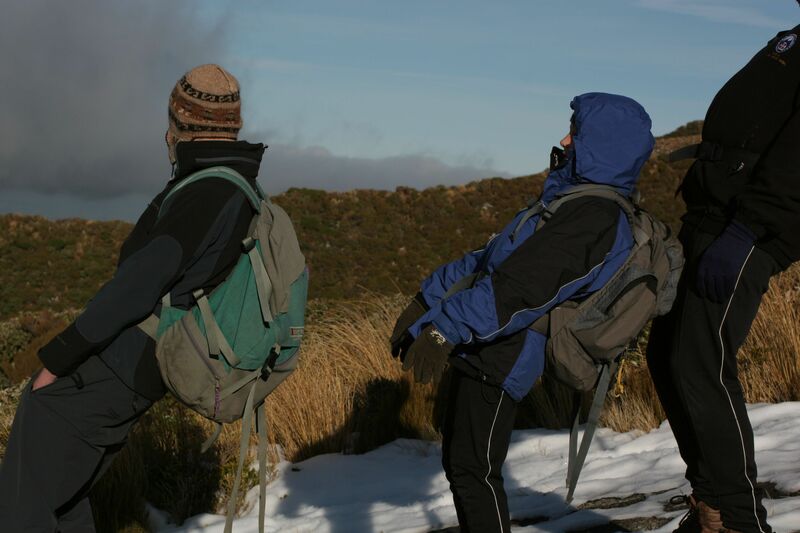 The biting cold was tempered by the sun and our own exertions warmed us up and we gradually shed the layers we had put on back in the carpark. 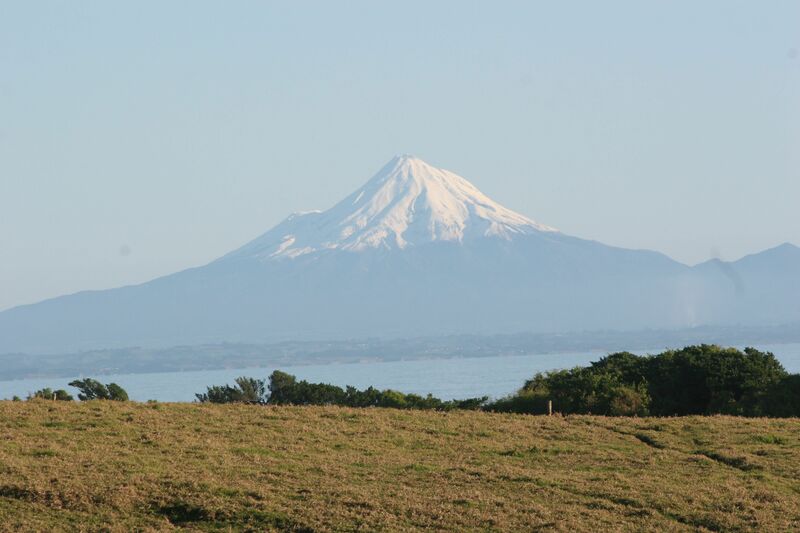 The unremitting upward nature of the walk was made easier by the sight of Taranaki in front of us, and whilst the view behind us of the valley was unclear and hazy the same could not be said of the Mounga in front of us. How tempting is its snowy peak and how envious am I of those who have the skill and nerve to climb it in winter conditions? Look, you can lean back much further than if you are on flat ground! around again… and so on for the rest of the afternoon. The hut is simple but serviceable, and you can imagine how cosy it could be filled with the camaraderie of walkers, the wood burning stove blazing away, food being cooked and stories shared. Today, though, it was cold and empty and it felt a little forlorn. However, it afforded us some shelter from the wind whilst we ate some chocolate and had a drink before continuing down through the bush to the Visitor Centre. The route back was one of those frustrating ones where you climb down gullies on ladders only to regain the height lost on the other side. However, the ups and downs made the last kilometre or so more interesting and avoided that tired ache in the hips you get from trudging along a flat, boring path at the end of a long afternoon out! 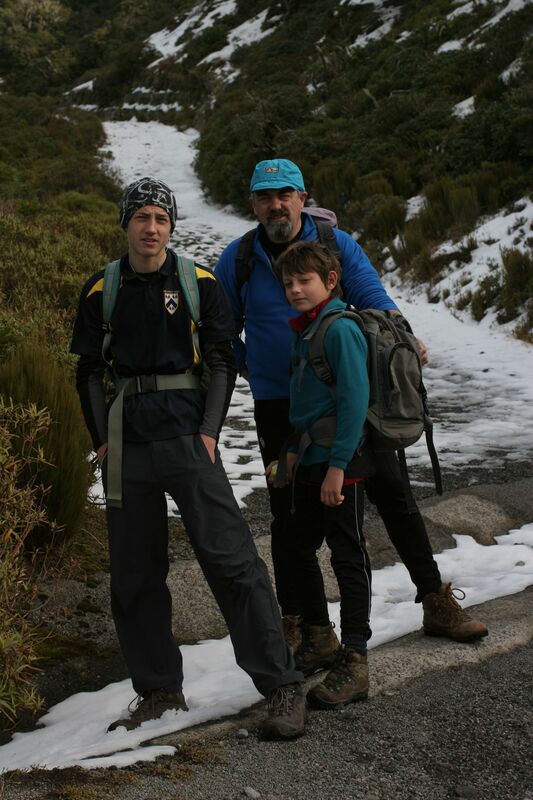 Gus kept me entertained as we went, telling me all about when he did the Tongariro Crossing with Nigel and the Scouts. He says he finds it difficult to write at school when they have to do memoirs as he can’t remember anything – he didn’t have too many problems today once he was given a few prompts! We arrived back to an empty carpark in the dusk of the evening, fell happily and tired into the car and back to the Bach on 45! 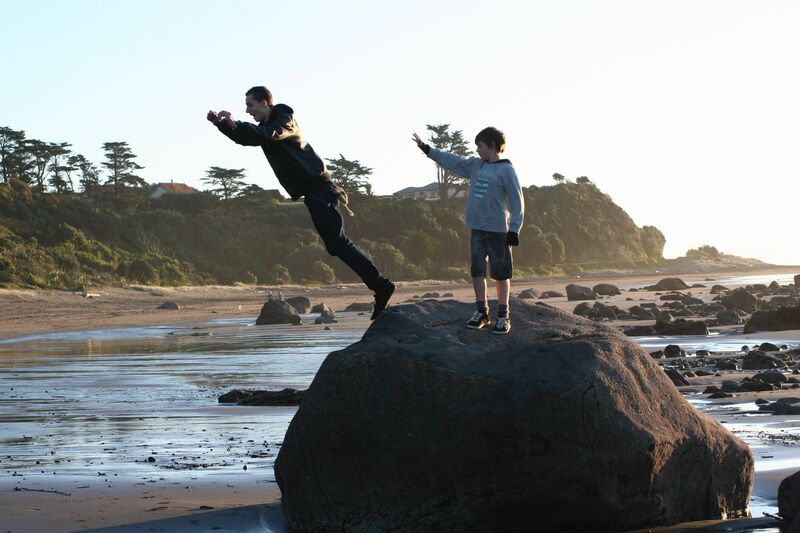 teenagers, nimbly climbing up armed with a tray full of bottles of pop – clearly Paritutu Rock is a favourite local haunt with the young of NP! substantial breakfast had worn off so ice-cream turned into snack as we sampled the wares of Elixir on Devon Street. Wedges; home-made bread and dips and French toast were hungrily wolfed down whilst we decided what to do next. I wanted to go to the beach and nobody seriously objected (or maybe I didn’t give them the chance!?) 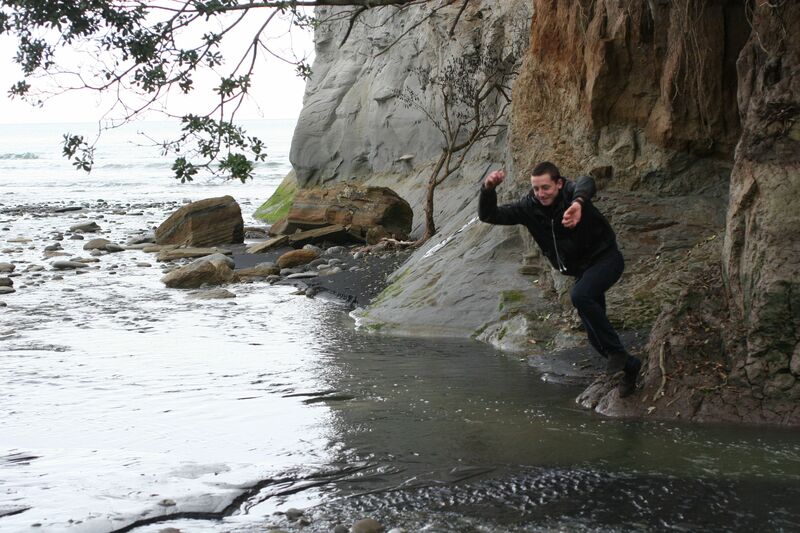 so we decided to explore the beach at Oakura. 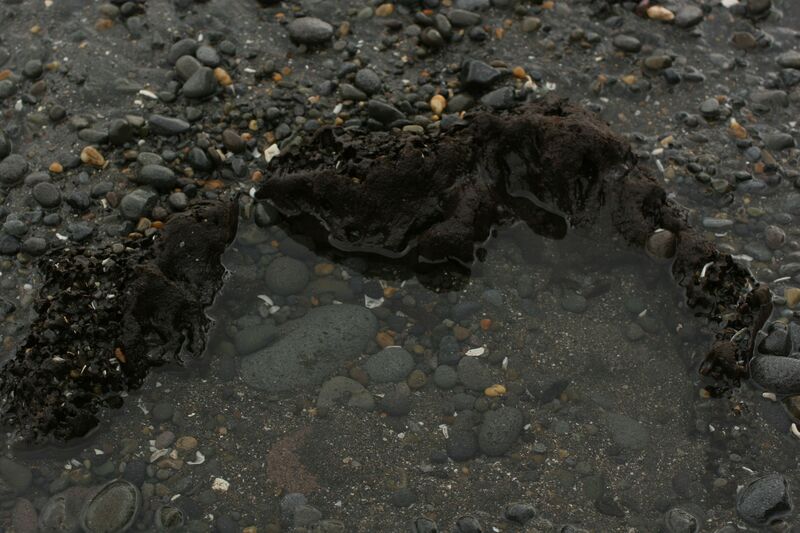 The black sand seems even blacker here than at Raglan and as we walked down the beach it waslittered with scattered rocks and boulders. 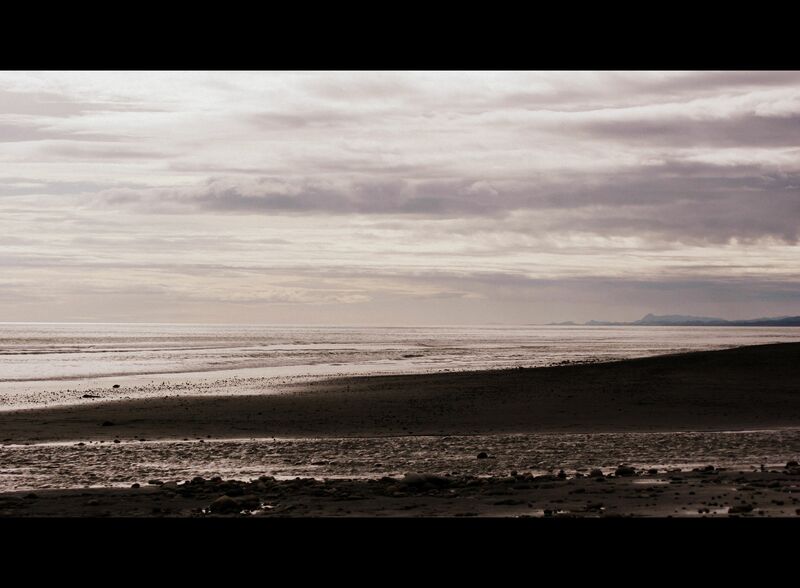 I love the sea and the sea-shore, the sounds the smells, theuntamed, untameable nature of it all; it makes me feel excited, just a little scared of its power and I am mesmerised by the constant movement of the waves as they roll in, crash and then are sucked back out again. I took far too many photos of the sun shining on the water and even more as we watched it go down and it turned the world orangey-red! Time for tea!